For centuries Umbria has held considerable artistic treasures spread amongst the region’s evocative hilltowns. The epicentre of the Renaissance was of course Florence but the fact that two of its major protagonists – Perugino and Pinturicchio – came from Perugia, together with the major role played by Saint Francis’s hometown Assisi in the commissioning art mean that Umbria was firmly established as a principal satellite. From one central and comfortable base in Montefalco you will experience the lifestyle, artistic and musical riches of Umbria at the time of overlapping music festivals. The Sagra Musicale Sacred Music festival of Perugia, The Spoleto Lirico Opera festival & the Segni Barocchi of Foligno present an exciting range of International performances in evocative venues spread across Umbria’s glorious hilltowns. An exploration of Umbria’s beautiful hilltowns and some of the most significant fresco cycles still to be found in the towns and cities of Umbria, you will benefit from the expertise and knowledge of local residents and guides who will lead you through a maze of hidden treasures often familiar only to those who live here. Tour cost: 2050EUR twin share per person, single supplement:From 350EUR per person. OPTIONAL EXTRA – Concert tickets will be additional, subject to which and how many you wish to attend. 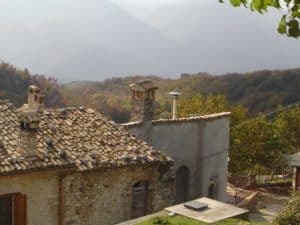 The family run 3 star country guesthouse located just outside the walls of the medieval hilltown of Montefalco, where a cluster of farm buildings has been converted into high quality accommodation. All rooms are furnished with solid antiques and have their own bathroom and private entrances. There is a shady garden with a swimming pool and spectacular views across the Valley of Umbria. The estate still produces their own vegetables, herbs, wine and olive oil which are used to prepare the delicious simple meals held in a pleasant dining room or outside under pine trees. From this base in the central Umbrian countryside, you are within an easy drive to all of the major medieval towns and cities in the region. On a clear day from the terrace garden of the guesthouse, we can see the ancient Etruscan city of Perugia to the north, the basilica and home town of Italy’s patron saint, St Francis — Assisi, to the south the tiny hill-town of Trevi noted in the region for its fine golden green olive oil, and further south down the Vale of Umbria, the dramatically-positioned town of Spoleto, settled in the Bronze Age half-way up the Apennines. Umbria today is both a richly fascinating example of man’s fruitful collaboration with nature over the last three thousand years and a living treatise on the history of European architecture. Not only is it replete with traces of the greatest builders of the ancient world – it sits astride the Roman Via Flaminia of which there are substantial tracts remaining – but it was also part of the heartland of the ancient Etruscans from whom the Romans learned so much of their engineering. But its period of greatest glory is the middle ages when European civilization comes out of the dark ages and the foundations of the world in which we still live were laid down. Romanesque architecture seems to grow naturally out of the ground, but Gothic also makes its appearance, culminating in the breathtaking cathedral of Orvieto, and then there is the Renaissance with its collection of fresco cycles by masters like Filippo Lippi, Luca Signorelli, Pinturicchio and Perugino which brings these centuries of creativity to a brilliant close. The long period of poverty that then ensued may have been hard on the Umbrians, but for us it’s meant that the region’s extraordinary wealth of art and architecture has remained substantially unspoilt, which together with its beautiful landscape of mountains and patterned fields make it one of Italy’s most satisfying tourist destinations. You will be met at Foligno railway station to be transferred to your accommodation at the Fabrizi estate near Montefalco. After lunch and time to settle in, we head up to the village and meet at the church of San Francesco in Montefalco. With special permission we are able to set up in the apse of the choir under the gaze of the beautiful 15th century frescos by Benozzo Gozzoli. Montefalco is a small town but its importance in late medieval and renaissance times is testified by the fact that it has produced six saints of the catholic church! Benozzo Gozzoli came here in 1450 after having worked with Fra Angelico in Orvieto – he was that maste’s favourite and most accomlished apprentice – and painted a life of Saint Francis that remains a jewel of mid 16th Century reanaissance art. It was his first commission as a master working in his own right, and it set him up to return to Florence to become the Medici’s principal court artist. Returning to the accommodation for a welcome dinner and relaxing evening. The special qualities of the morning light are captured as we head into Spoleto where we begin with a short orientation stroll entering the town over the dramatic “Ponte delle Torri”, a medieval aqueduct bridge with 10 towering arches to the main square. In 1463 that fascinating friar Filippo Lippi came here to paint the apse of the duomo with scenes relating to the life and death of the virgin. Only a few years after the discovery by Brunelleschi of the rules of perspective, his treatment of the annunciation is masterly. Signed with a fullsize self portrait showing him making the still current hand gesture of “le corna”, (whose significance is to fend off bad luck) he died while still working on the fresco. It was finished by his teenaged son Filippino, who also designed the tomb nearby. OPTIONAL CONCERT: Spoleto for a performance of a new opera Ehi Giò commissioned in 2010 and written in homage to Rossini, as part of the Spoleto Lirica 2016 repertoire. Perugia is Umbria’s largest town is a rich microcosm of medieval and modern. Its highlights include the magnificent frescoes in the Collegio del Cambio and the town’s famous chocolates. Once an important Etruscan settlement, Perugia has piled up layers of history ever since, turning Renaissance palaces into shops and inserting modern escalators into medieval remains, Perugia’s surprising underground city. In addition to the splendid Galleria Nazionale dell’Umbria with its Fra Angelico’s and Piero della Francesca’s (the latter’s hometown of San Sepolcro is on the border between Umbria and Toscana) there is the quite extraordinary Collegio del Cambio, a densely frescoed room that was once Perugia’s financial exchange. It was painted by Perugino at the height of his powers in 1500 as a kind of manifesto linking heroes of classical antiquity with characters from the bible and contains breathtaking colour and composition that must have been very influential to the young Raphael who at the time was his teenaged apprentice. And on the way back to the accommodation, we travel to Deruta to browse through the ceramics in this famous artisan town since medieval times where you will be shown through a selection of some of the 300 outlets selling majolica or brightly coloured plates, and bowls. Return to dinner at the accommodation. Stay in Perugia and attend the opening performance of the Perugia Sagra Musicale Festival in the lovely Teatro Morlacchi, the city’s main theatre, originally opened in 1781. You will wake gently to the sound of many distant church bells and enjoy breakfast in the garden overlooking the valley of Umbria. Then travel through a dream landscape to Assisi, the home of St Francis, Italy’s favourite saint. Your guided tour includes the Basilica of San Francesco decorated with frescoes by Giotto. The morning includes a guided tour of the town, including the Roman remains under the still-standing temple of Minerva, and the Basilica of San Francesco at the lower end of the town is a treasure trove of medieval and renaissance art. The canonical life of the saint is here, attributed in the 16th Century to Giotto but very likely the work of a number of great masters including little known Pietro Cavallini whose work here could well have been the crucial inspiration for the young Giotto when he was there in 1300. There is gorgeous work by his Florentine master Cimabue, and the Sienese painters Pietro Lorenzetti and Simone Martini. It rivals any church in Florence for richness and quality. Today we head to the stunning medieval town of Spello, dressed in fairytale pink and cream stone and home to a great treasure of art, “The Annunciation” by Pinturicchio. The essence of Spello however are the tiny laneways lined with flower clad balconies tended with great devotion by the local people. 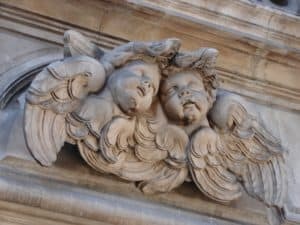 There is great choice of subject matter today as you may be inspired by toga clad Roman sculptures standing guard over the entrance gates or perhaps capturing the spirit of the cobblestone laneways with all their beautiful detail unchanged for centuries. 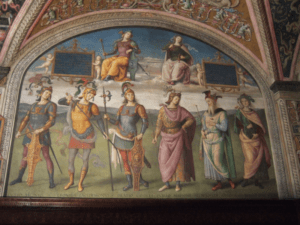 Pinturicchio is often described as Perugino’s disciple, but younger colleague would be more accurate, and at the same time that the older man was working in the Collegio del Cambio at Perugia Pinturicchio was producing a memorable fresco cycle in Spello’s Santa Maria Maggiore. Painted for a member of the Baglione family who at that time were Perugia’s equivalent of the Medici (but would soon all be strangled in prison as the Pope took control of the city), it represents the Annunciation, Nativity, and Jesus disputing theology in the temple. It is a masterpiece of extended decoration, the self portrait with which it is signed an exquisite picture within the picture. The Duomo of Orvieto is one of the great churches of Italy, and it contains in its right transept one of the renassance’s most significant fresco cycles. Painted in 1500 by Luca Signorelli, it’s subject is the Apocalypse, considered by many at the time to be imminent following the disturbing career of the dominican friar Savanarola who a few years before had established an ill-fated theocracy in Florence. Michelangelo was deeply impressed by this work, in particular the scenes of writhing devils in the hell panel, and it served as a starting point for his work in the Sistine chapel. Our drive to nearby Bevagna winds along the edge of a hill where we can clearly see the cities of Spello and Assisi across the broad valley. It is the piazza in Bevagna, considered to be one of the most evocative in Umbria which draws us today. Decorated with two of Umbria’s most splendid Romanesque churches built with Roman ruins believed to be taken from the pagan temple of Isis, recycled with subtle geometry, incorporating muscular stone interiors and unusual Egyptian capitals. There is much more to the walled town of Bevagna however, with a delightful main shopping street displaying traditional crafts that makes for great diversion as we find a special place to set up easel for the last time. This evening we enjoy a final farewell dinner. Please note: This is a preliminary itinerary, and the programme may be altered to accommodate group sizes, seasonal variations and activities, including local festivals. However the essential content of the itinerary will remain the same. B L D means that breakfast, lunch and/or dinner will be included that day. The 2017 programme for the music festivals is yet to be set, so we have included the details from this year’s concerts to give you an indication of the type of performance you may get to enjoy.